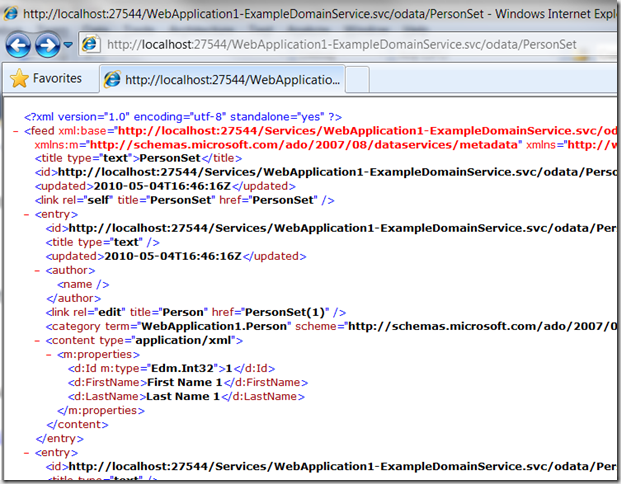 Following on from the previous post, I thought I’d dig a little more into what makes up a WCF RIA Service DomainService rather than taking the approach that we took in the previous blog post/video where I just added an Entity Framework model and let the tooling create a DomainService for me based on that model. Going down that route allowed the tooling to build a DomainService for us that derived from LinqToEntitiesDomainService<T> where T is our LINQ to Entities ObjectContext. LinqToEntitiesDomainService<T> is ultimately a DomainService and that’s where I could start if I wanted to strip away some of what the tooling was doing for me in order to get to a clearer picture of how things are working “under the hood”. ( taken directly from the metadata in Visual Studio ). and so there’s quite a lot in this one class. 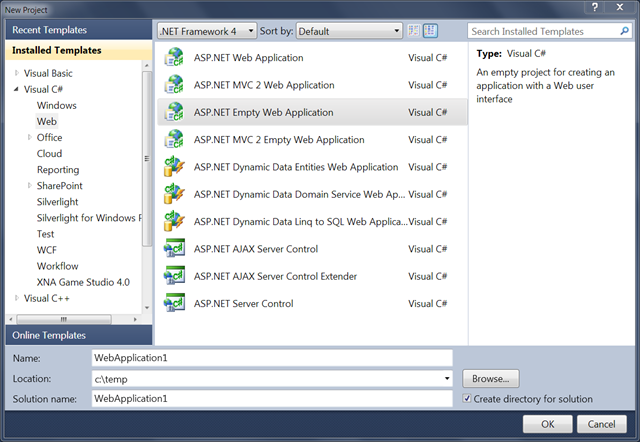 If I create a new empty ASP.NET web application project in Visual Studio. along with the necessary references ( System.ServiceModel.DomainServices. * at least ) to make this build. 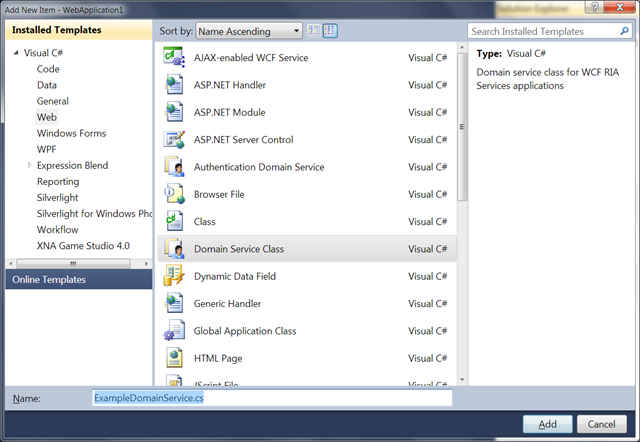 In my web.config file I also notice that a module is added to the pipeline – DomainServiceHttpModule – and ASP.NET compatibility is turned on for System.ServiceModel. 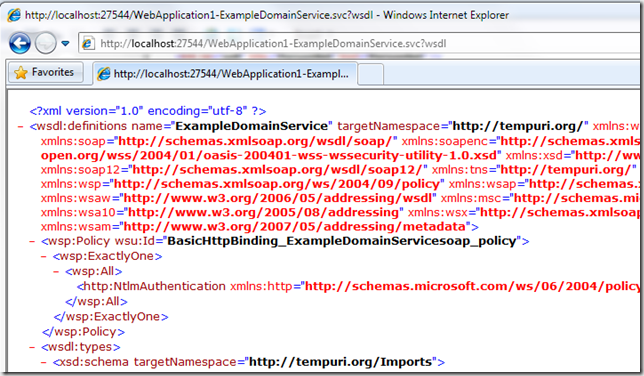 So, what’s the role of the DomainServiceHttpModule? 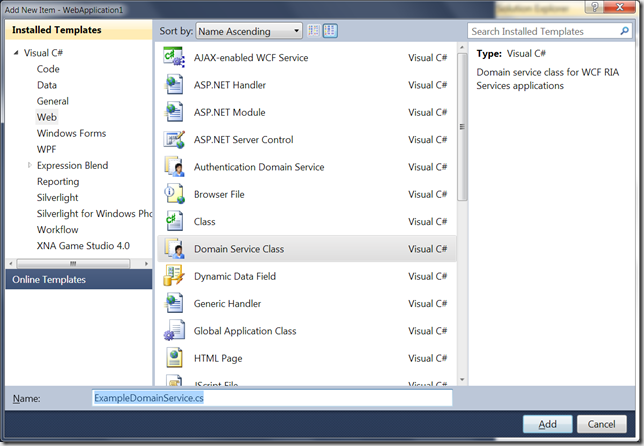 It uses a VirtualPathProvider in order to dynamically make available service(s) that it constructs from DomainService derived types that it finds in the referenced assemblies of the application. where VROOT for me was localhost:27544 because I was serving up my web application project via Cassini on port 27544.
and so this factory is used to bring in a custom service host for WCF ( DomainServiceHost ). and then building a service description based upon what it finds. In terms of the endpoints, the DomainServiceHost makes available a default endpoint over HTTP (or HTTPS) using a binary encoding and it also adds in an authentication scheme based on what it sees being used by the default webHttpBinding that you have configured. That is – as an example, if webHttpBinding is using “Windows” authentication by default then the default endpoint will do the same. 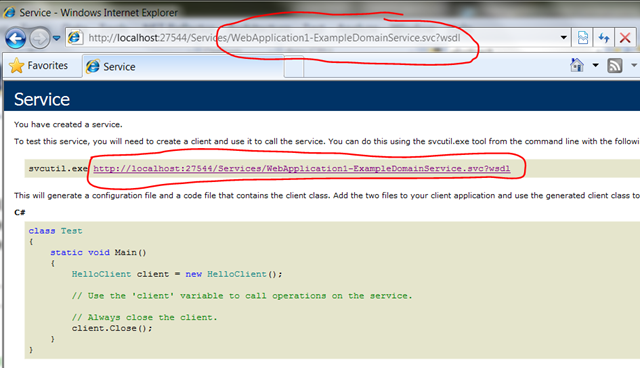 which makes sense in that my DomainService has no functionality available on it. The simplest thing I could do is to add an operation to it and the simplest kind of operation that I can add is an Invoke operation because those are closest to standard WCF service operations in that they are calls from client to service that are simply executed ( asynchronously ). 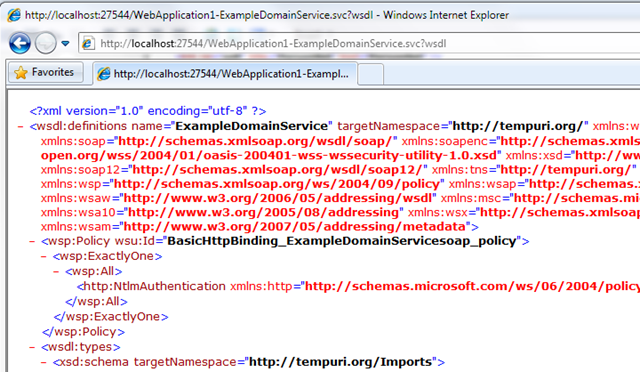 Now – I can’t get WSDL for this endpoint even though there’s a link there. That’s not the intention for this default endpoint. 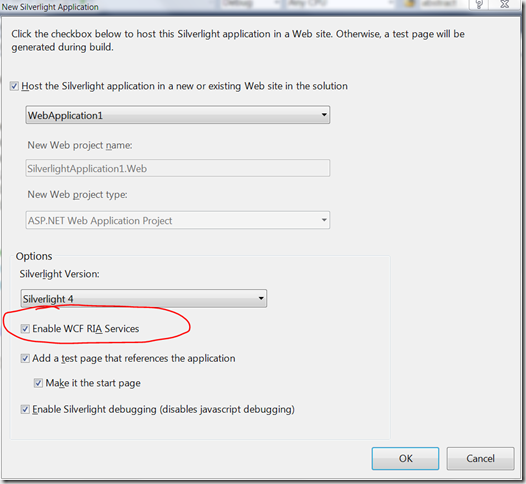 This default endpoint is for easy access from a WCF RIA Services client. It’s possible to expose other endpoints for access from other clients ( I’ll return to this ) but this endpoint is the default one and is targeted at easy, efficient calling from a WCF RIA Services client. and that all works fine and calls my service-side operation for me without any additional steps. 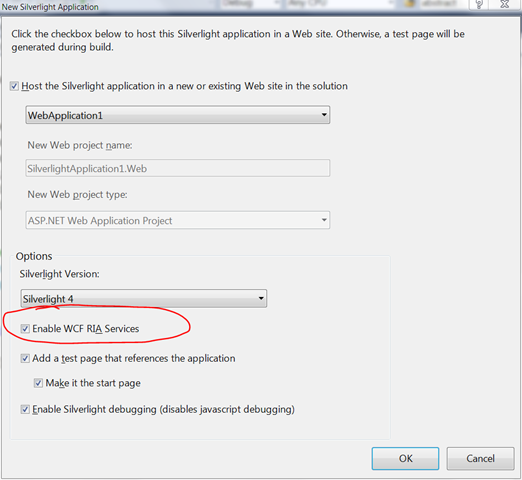 which is being called with the method that the client side wants to invoke and the parameters for that method. 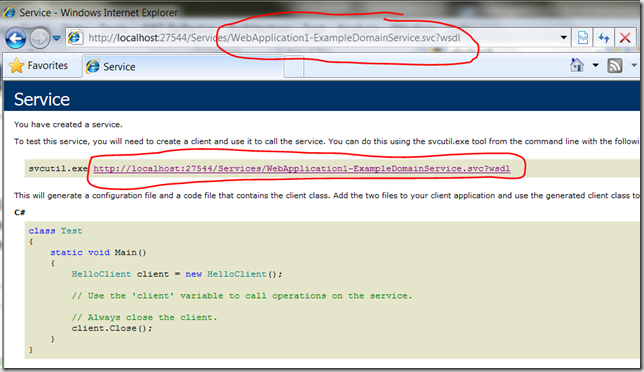 Then my actual Add method would be invoked, the return value gathered and sent back to the client. So, the DomainService has a sort of “life cycle” for handling client-side calls and here the invocations coming from the client cause the service-side code to go through a cycle of Initialize->Invoke->MyMethod. Now, whilst this ease of calling without an explicit service reference has some advantages over just using raw WCF it’s more likely that we’d want to expose sets of entities for the client to operate on and we see a lot more benefit in doing that. but that won’t work even with my made up test entities being returned. was binary encoded but the important point is around the client’s automatic ability to communicate with the service – not the particular protocols that it uses to do it. a call arrives into the Query method and you can see that the Method is specified and the Query is specified and IncludeTotalCount is specified – it’s all come into the call. Then the base class implementation here will take that and route it to my method GetPeople() to actually get the data that is then used as the basis of the query which can then be executed and the results returned to the client. Ok, so now when I rebuild I see a change on the client side. Previously, I noticed that the DomainContext on the client side has a generated override called CreateEntityContainer and in my case this is creating an instance of a generated class called ExampleDomainEntityContainer. and so you can see that we get a call to Submit() and what’s been sent from the client side is a ChangeSet and the debugger clearly shows that the ChangeSet contains one insert, one update, one delete. and you can see that the ChangeSet in progress is represented in this.ChangeSet for access. There’s also the AuthorizationContext property which is null in this case ( more on that in a later post ). 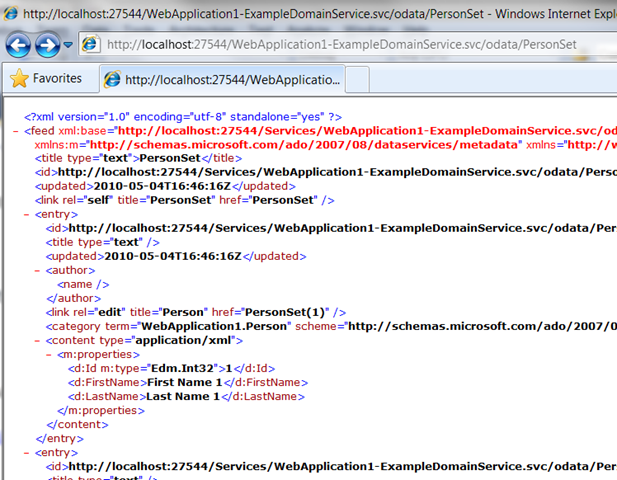 followed up with a call to ExampleDomainService::PersistChangeSet() at the end of the cycle. Up until now, my service has only offered the single entity set Person but it’s pretty likely that we’d have related entities in the model that I’d want to expose. Perhaps Person can have a set of addresses. Note that in order to relate entities, I have the Address.Id property but also the foreign key of Address.PersonId which links back to the “owning” Person entity. There’s also an attribute [Association] which I’ll apply to my Person entity which tells the framework which properties to look at in order to determine these key values. The framework also needs a bit more help in the sense that it needs to know whether the Addresses belonging to a Person are there for server-side programming or to be included down on the client-side. This is done via an IncludeAttribute. you might also notice one other attribute has crept in – the CompositionAttribute. What’s that for? Well, there’s a very good explanation here but what it’s essentially saying is that (in this model) the Person owns the Address and so (e.g.) removing the Address from the Person means the Address needs to be deleted – it doesn’t exist in its own right. where it’s worth noting that this is one query to the service rather than one for the Persons entity set and then one for each set of Addresses belonging to them ( i.e. Addresses are not being lazily loaded here ). so my client-side work gets nicely replayed to my service-side and if I had a proper data access layer under these classes then it would do something with my data-store to actually make these changes live. This post has got long but there’s one last thing I wanted to squeeze in. The RIA Services Client<->Service communication is largely automatic and the focus is on getting the functionality built rather than worrying about protocols and so on underpinning it. However, that doesn’t mean that you can’t access these services from elsewhere and there’s a few ways of doing it. but I’m not sure that I can take that further by adding ( e.g. ) additional parts to the query such as indexing into the data by primary key or starting to build up expressions including $top, $skip, $filter, and so on. An OData endpoint is just an example here though. It’s possible to expose other kinds of endpoints for other kind of clients. There are two more possibilities within the RIA Services Toolkit ( SOAP and JSON ) or you can write your own. 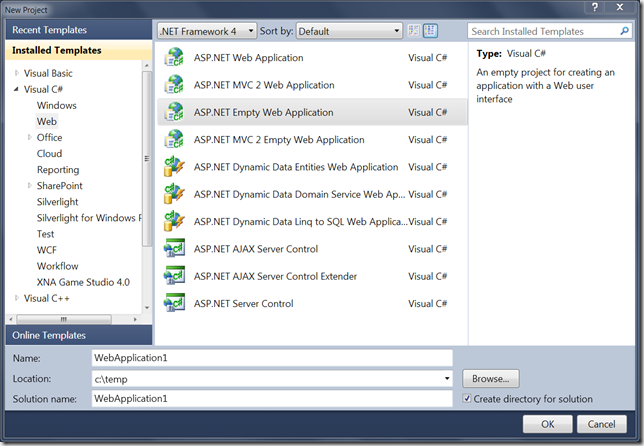 and I can go and do an Add Service Reference against that from Visual Studio (or some other IDE or tool) and start to work with my service in that way.